Sixty kilometers away from Adiyaman, it was the summer capital of the Comagene Kingdom. At the foot of the ancient Arsemia, there is a magnificent relief of Hercules greeting Commagene King, Mitridate. Also found the greatest Greek inscription in Anatolia. Eski Kale is near Eski Kahta (Kocahisar) and is the ancient fortress of Arsameia, built with no small effort on a steep cliff. Its walls and parapets are still in good condition. On a special path, that was used for religious ceremonies leading up the mountain side, is a statue pointing the direction to the temple. Another 100 meters farther along is a Dexiosis relief showing a hand-shaking scene between King Mithradates and Hercules, carved in about 50 B.C. Near this relief are rooms hollowed into the rock that were particularly used for religious ceremonies. Following along this footpath still upward one comes to the largest rock inscription in Anatolia. It tells of the political intentions and the religious beliefs of the Commagene Kingdom, that Arsameia was its capital and that Mithridates, the father of Antioches I, was buried there. Just below this inscription is a large opening that descends by a stone stairway to a depth of 158 metres. This passageway leads to Arsameia but now it is blocked off half-way along. Above this inscription, following the path up the mountainside, are the foundations and mosaic floors of the Arsameia Palace. In Commagene (southeast Turkey), on the river Numphaeus (Kahta cayi), a tributary of the Euphrates. Refounded by Arsames (Arschama)- from whom, according to one view, the Seleucid royal family traced its descent- over a very ancient settlement on the road between Melitene (Malatya) and Samosata (Samsat), Arsameia became a military strong point and the site of a mausoleum and cult center hierothesion) built by King Antiochus I Theos Dikaios Epiphanes Philoromaios Philhellen of Commagene (69-before 31) in hnor of his father King Mithridates I Callinicus. Above a rock-cut inscription is a relief (now re-erected) on which Mithridates I is seen clasping the hand of Artagnes, a Persian deity whom the Greeks identified with Heracles. A mile outside the town is a Roman bridge erected by 4 Commagenian cities in honor of Septimius Severus (c AD 200); and further on, beside the Numphaeus, stands a mound that provided the burial place for royal women. 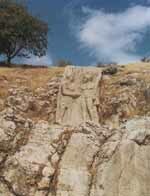 Antiochus I set up a similar center in his father's honor at a second Arsameia on the Euphrates, the modern Gerger.